GEOFFREY CIANI: Hello everyone. This is Geoffrey Ciani from East Side Boxing, and I am joined by lightweight contender Ray Beltran who is coming off of an upset victory against Hank Lundy last Friday night. How’s everything going today, Ray? RAY BELTRAN: I’m great man. Thank you. CIANI: Great! Now Ray, you’ve had a few days to reflect on your victory. Looking back on it, what did you think of the fight and how would you evaluate your perfomance? BELTRAN: I think fight was a great, great fight for me. I don’t really have the right words to express what I feel. That’s how happy I am. I thought my performance was good, you know. It was good, but I think I could do better. I’m satisfied, but at the same time I want to do better. CIANI: Now in the third round of that fight, you seemed to have Lundy in some trouble. You had him up against the ropes there, and then at the very end of the round you guys both caught each other with left hooks that you landed at the same time. What were you thinking at that point in the fight, and did you think that you might have had a chance to get him out of there? BELTRAN: I think if the round goes a little bit more, I think I could have maybe stopped him because he was hurt. He caught me good with a solid hook. He caught me good, but I mean honestly I saw the punch. I didn’t really feel hurt. I was a little bit off balance. But I mean the punch was good, and he caught me with it really good, but I wasn’t really hurt. CIANI: Now one thing I noticed during the fight was when you were doing your most effective work, you were working the body, and you were landing some good left hooks and some good lead left hooks. Is that something you specifically worked on in your preparation for your fight with Lundy? BELTRAN: Of course! I was in the gym, and we were working on the body punching. We knew he was a really slick fighter. He moves around and he knows how to use the ring. So even during training, we were working on throwing a good left hook with body shots. I think the body shots were the key for me in the later rounds. CIANI: During the middle rounds, Lundy started to box more. He seemed to be working his jab a little bit during the middle rounds, and he seemed to be regaining the momentum of the fight. What were you feeling during those middle rounds, and did you feel that he was starting to box more and doing more effectively in there? BELTRAN: It was my fault. It was my fault because in those middle rounds I let him take control. I kind of slowed down and he started getting busier, and I let him. But then I realized, you know what, I just have to let me hands go and get a little busier to stop him. It worked. Once I started getting busier it was like I took over control of those rounds. You know. CIANI: Towards the end of the fight, you seemed to regain control. What other adjustments did you make to do that? BELTRAN: Just being first! I had to be first, you know. In the middle rounds I let him work. That was my mistake. What I should have done in those middle rounds was just continue my intensity and just being first and being busier and being first. That was the key. CIANI: When the final scorecards were read, the first card had it 95-95 even, and the other two judges had it 96-94. When you heard the scorecards read, did you think you were going to get the decision? BELTRAN: Honestly, no. I really thought maybe I’d be getting robbed. You know I was in his hometown, his backyard, and they had really big plans for him—everything! When they were reading the decision, I was like I’m done. I’m screwed! Honestly I didn’t expect that they would give me the decision, but that is great. They put up good judges, and the judges did a really good job. CIANI: Now you’re currently trained by Pepe Reilly. Can you tell the fans out there a little bit about the working relationship you two have together as trainer and boxer? BELTRAN: Well Pepe, I’ve known Pepe for like nine years, ten years. He’s been my trainer since I moved to LA with my friend, and it is a really good relationship. I like to be surrounded by good people, people that I like and I trust. Pepe’s been like making some adjustments for me. I’m working better you know, with combinations and stuff, and working to the body. We’ve got a good relationship. We’re friends and he’s a former Olympian. Pepe Reilly is a former Olympian. He went to the Olympics in ’92 with Oscar De La Hoya, and he’s got a lot of experience. CIANI: Now you also previously worked with Hall of Fame trainer Emanuel Steward earlier in your career. Can you tell us a little bit about those experiences? BELTRAN: Working with Emanuel Steward was a great experience. Emanuel Steward is a great man. He’s also a great trainer, and I was there for like three years. He likes you being very aggressive. He likes knockouts, you know. So he is the kind of trainer who likes you to be very aggressive, but he likes to make sure you get the victory. It was some of the best years of my life in forming my boxing career. But you know for some reason we couldn’t get it on, and it wasn’t good for him. So I’m blessed right now, and it was great to get to know him. CIANI: With this victory Ray, where do you currently see yourself in the 135 pound division? BELTRAN: To me I think I’m ready to fight anybody. I’m the kind of fighter, I don’t duck anybody. I’m a true fighter. I see myself like fighting the best guys, and getting in a big fight where I make the money. I deserve a big opportunity with a big name to make the money. 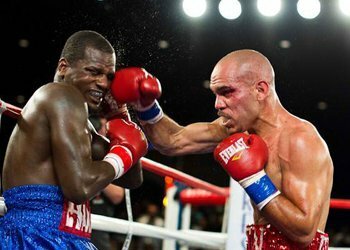 CIANI: If it came around that you had a chance to have a rematch with Lundy, it was an entertaining fight on Friday Night Fights ESPN, would you be willing to grant him a rematch if that came together? BELTRAN: Of course! Anytime! He gave me the opportunity, and thanks to Lundy I have this victory that’s helped my name in the boxing world even more now. That was all because he gave me the opportunity, and I would give him the opportunity, too. But I think me and Lundy, I think we deserve something better. I think we deserve to really fight on a big show where we can really make enough money. He’s got some good names on his record. You know he’s willing to fight anybody. He’s a solid fighter, and we’re the same type of fighter. I think we are the ones that deserve to really have a big opportunity out there. We will show the people and put on a good show, and the people need to see these kind of fights. CIANI: Now Ray, you just turned 31 years old, and you just scored the signature victory in your professional boxing career. Do you think your best days as a boxer are still ahead? BELTRAN: I mean in boxing for some reason you go through a lot of phases in your boxing career with ups and downs. But with me I’m a true fighter. I’m a healthy guy. I don’t drink, I don’t smoke, I don’t do drugs. I don’t even go to the clubs, you know I mean. I’m a clean guy, and I got even more experience now. Mentally I’m getting stronger. I got technique. I mean I believe in myself, and I believe I could become better. I believe that’s the key, you know, taking care of your body. You can last longer and you see more fighters today fighting over 40 and they’re still fighting good. So why not me? CIANI: What would you ultimately like to accomplish before all is said and done with your boxing career? BELTRAN: I want to be a world champion, but also if I don’t become world champion I want to fight the best. I want to win those fights. I fight to win! I don’t fight just to put on a good show, and that’s what makes fights exciting. But I want people to remember my name. I want my name to be on people’s minds, and I when they talk about me, I want them to view me as a true great fighter and a true champion. I want to get a world title. CIANI: Ray, for my final question, is there anything you would like to say to all of your fans and supporters and all of the readers of East Side Boxing? BELTRAN: Well I want to say thank you and God bless you. For everyone out there who believes in me, may you never lose hope in me. I mean I really can’t think enough all the writers who take time to write and talk about me, and even some of them who say some of the negative things. Thank you, too, because instead of putting me down, I use all of that to make me stronger and it inspires me to win the fight because I try harder. God bless ya’ll man! Don’t stop supporting me, because I got my heart and I’m honestly going to be willing to put on a good show. And God bless everybody. Thank you! CIANI: Well Ray, it’s been an absolute pleasure getting the opportunity to speak to you after your impressive victory last weekend. Thank you very much for your time, and I wish you the very best of luck going forward in your career. BELTRAN: My man, thank you very much!